BEIJING: A fire fighter was killed in the major fire at a warehouse storing chemicals and fuel which was doused after overnight work by more than 1,000 fire fighters in China’s eastern Jiangsu province. The fire, which began around 9:40am on Friday at a facility owned by Jiangsu Deqiao Storage Co. in Jingjiang, was put out at 1:50am on Saturday. Fire fighter Zhu Junjun, 26, was killed when he was caught in the flames after delaying evacuation to continue spraying water on the blaze and to cover other fire fighters, according to the department. More than 1,000 fire fighters worked overnight to douse off the blaze. 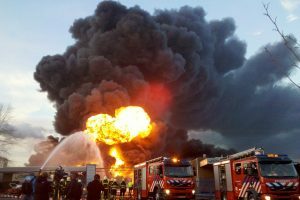 With chemical storage tanks destroyed and their contents spreading over a wide area, fire fighters had difficulty approaching for a while. They curbed the blaze after the valve of an oil pipeline was shut off, state-run Xinhua news agency reported. Two fire engines were destroyed in the fire, the department said. the rest 30 contain dangerous chemicals including alcohol and lipid. About 15,000 people live within five kilometres (three miles) of the blast site, which is also close to two drinking water and three ecological protection areas, Greenpeace said in a statement. “The government must urgently investigate the dangers hazardous chemicals in China pose to people and the environment and act to prevent these all-too-common incidents from occurring again,” its East Asia toxics assistant manager Cheng Qian said. 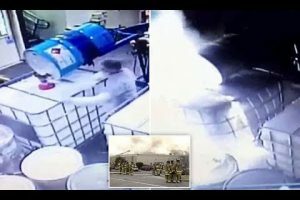 The incident took place on the premises of a company called Jiangsu Deqiao Storage, which is authorised to keep hazardous chemicals and fuel, reports said. Its parent is a Singapore-listed company called Hengyang Petrochemical Logistics. Photos and videos of the accident posted online showed an enormous pillar of black smoke towering above orange flames. Some 400 fire fighters were mobilised to fight the flames, fed by petrol storage tanks on the site, the fire department under the Ministry of Public Security said on its microblog.